As always, the NBA is busy with community work. Dwight Howard, Gilbert Arenas, Kevin Martin and Ime Udoka all spent a little time with kids. The Bulls are assisting an elementary school, and the Nets’ Devon Harris shows appreciation to a police department. 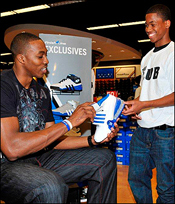 Dwight Howard: Orlando Magic C Dwight Howard donated $20,000 to the Pine Hills Boys & Girls Club on April 2. Howard, who recently won the Ace Hardware Helpful Player of the Month award, also presented 50 members of the club, between ages 13-17, with $100 gift cards to Finish Line. Howard said, “There are a lot of things I do just for my community. It doesn’t have to involve the media or cameras being around; just being out and spending some time with the kids is the biggest thing” (Dan Savage, Orlando Magic, 4/3). Meanwhile, Howard was named the 2008-2009 winner of the Rich & Helen DeVos Community Enrichment Award at the 19th Annual Orlando Magic Youth Foundation Black Tie & Tennies Charity Gala. This marks the third time Howard has won the award (Orlando Magic). The teenagers were “bound for Indianapolis to watch the NCAA tournament,” but first stopped at Verizon Center “for their first NBA game.” One of the kids, Zhanysh Adiev, said, “Since I started playing basketball that was my dream, to watch a game of NBA players. Look at me. I’m shining like a new pin” (Dan Steinberg, Washington Post, 3/23). Kevin Martin: Prior to the March 29th Phoenix Suns-Sacramento Kings game at ARCO Arena, nine-year-old Ausin Gilchrist, who was granted one wish through the Make-A-Wish Foundation, met his “hero,” the Kings’ Kevin Martin. Kings Connect’s Andrew Nicholson wrote, “Throughout Martin’s entire pregame routine, Austin tagged along. He checked out the Kings locker room, shook hands with Suns point guard Steve Nash, joked with Francisco Garcia, assisted Martin with his stretching at center court, rebounded and shot on the hardwood and looked on as Martin signed autographs for the crowd of fans that lined the Kings sidelines” (Andrew Nicholson, Kings Connect, 3/30). Afterward, the group got a unique opportunity to tour a recycling truck to learn more about the importance of recycling in an effort to apply the knowledge learned from Ime’s book reading (San Antonio Spurs). Devon Harris: New Jersey Nets G Devon Harris brought “some happiness to Hackensack March 24 when he came to celebrate the efforts of Asbury Park Police Sgt. Connie Breech, who won the Dunkin’ Donuts Serving Heroes contest. As Breech and Harris shared breakfast, it wasn’t just about munching doughnuts. It was about making a commitment to, and a statement about, the value of community service” (Mark Bonamo, Hackensack Chronicle, 4/3). Chicago Bulls: As part of the Chicago Bulls’ Read To Achieve program, the Chicago Bulls hosted a virtual book drive on Bulls.com to benefit an elementary school on the city’s west side. The books collected will support the after-school programs at Calhoun North Elementary where science and math are a primary focus. Meanwhile, the Bulls and Verizon Wireless hosted more than 500 Bulls fans at the 20th annual FestaBulls dinner auction on April 2. Held at United Center, the event raised funds for CharitaBulls, the charity arm of the Bulls that promotes youth programming (Chicago Bulls).